Maternity clothes bundle size 14 includes; Midi length dress- really pretty design, size 14, from Mothercare. Pink short sleeved top, white and pink striped 3/4 length top both size L from Mothercare. Over the bump grey jogging bottoms, very comfy, size 14R from Mothercare. Over the bump black cotton trousers, size 14R from Mothercare. Over the bump dark blue jeans, size 12 from George. White vest top, size 16, from New look. Condition is Used. From smoke and pet free home. Dispatched with Royal Mail 2nd Class. All actual maternity unless stated. Atmosphere navy skirt, splits up both legs - not actual maternity but has elastic waist band. Love to lounge nightie - not actual maternity size XL - ideal for hospital bag and nursing. Bundle Of Six Maternity Tops, Next, Debenhams, H&M etc. The last blue one is also a breastfeeding top. The stripped one is bobbled but it did this after the first wash. It is nice to wear with jeans but you do have to de-bobble it. Condition is Used. Dispatched with Royal Mail 2nd Class. Maternity Summer Bundle size 14. Worn a few times are all in excellent condition. 1 x under the bump size 14 next denim shorts 1x under the bump size 14 next denim skirt 1 x over the bump denim shorts not sure of make. Comes from smoke free home. Dispatched with Royal Mail 2nd Class. 1 x grey maternity over the bump jeans from H&M 1 x black pattern baggy cotton harem pants, under the bump style from Mothercare 1 x forest green knit thin jumper from H&M All are used, but plenty of wear left in them and perfect for spring and summer! From a smoke free home, and dispatched with Royal Mail 2nd class. Happy Bidding! Black smock elastic vest H&M Mama M. Maternity bundle, all your basics sorted! Black Longline vest Next Maternity 14. Coral longline vest Dorothy Perkins Maternity 14. Denim jeans with jersey bump band Next Maternity 14R. Quality Maternity Bundle for sale. 1 dress alone cost £50, so it is a good value quality set. - 1 grey maternity and nursing top. Blooming Marvelous by Mothercare. - 2 maternity T-shirts that are elasticated by the Bump. Maternity Bundle 2 x Shorts And 1 Skirt H&M, Blooming Marvellous. Condition is Used. Dispatched with Royal Mail 2nd Class. Maternity tops bundle size 14. Condition is Used. Dispatched with Royal Mail 2nd Class. I have also put in a pairs of black maternity comfy trousers that I found in a 14. - New Look Grey 3/4 sleeve top. - New Look Black 3/4 sleeve top. - New Look yellow vest top. - New Look green T-shirt. maternity clothes size 12-14. Condition is Used. Dispatched with Royal Mail 2nd Class. 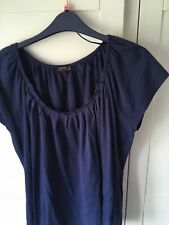 Blue Maternity top (Dorothy Perkins)size 14. Maternity clothes bundle size 14 & 16 New bikini 10.00 New look skinny jeans used 10.00 Mamalicious swimsuit size 16 10.00 Job lot 30 Condition is Used. Dispatched with Royal Mail 2nd Class. Maternity Bundle Spring/summer Size 14 NEW. Condition is NEW WITH TAGS. Dispatched with Royal Mail 2nd Class. Red strappy top from new look maternity range Grey vest top, loose fitting, from new look maternity range Black over the bump soft jeans from Dorothy Perkins ALL SIZE 14 never worn, with tags. 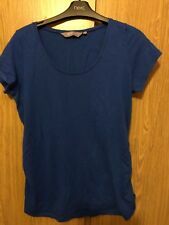 Bundle Of 2 New Maternity T Shirts Tops Size 14 New Look. Condition is New with tags. Dispatched with Royal Mail 2nd Class. Condition is Used. new look pinstripe maternity shirt - size 12 - excellent condition. Black ASOS maternity dress size 14 - very good condition. Black George maternity top size 12 - very good condition. Stunning Evie blouse - size 14. Size 14, Inside leg 26". SIZE WILL BE LARGE OR 14. Small 8-10.